Last weekend was full of food and fun at the 2012 Food Network New York City Wine & Food Festival presented by FOOD & WINE. 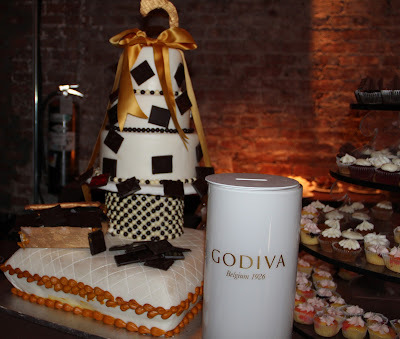 I kicked off the NYCWFF with the signature dessert party that helped launch the Festival - GODIVA presents SWEET! The fifth anniversary party was held on October 12th at 82 Mercer Street, sponsored by ZED Moscato Rose hosted by Sandra Lee with special guests. The celebration featured the most phenomenal artisanal ice creams I've ever tasted, along with luscious gourmet cakes and cupcakes. One unforgettable masterpiece was the enormous GODIVA birthday cake created by Chef Duff Goldman in celebration of the new GODIVA Cake Truffles Collection and 5th Anniversary of the NYCWFF. At the end of the night, the GODIVA SWEETest award was announced and awarded to Chef Elizabeth Karmel from Hill Country Barbecue Market and her PB&J Cupcakes with GODIVA Pearls. Pleased to know about your fifth anniversary party. It’s my friend’s ring ceremony next month and searching for beautiful corporate event venues San Francisco. Got to know about excellent venues and looking forward to book best one soon.